Marcelle is coordinator of DESGW project, which had a very exciting year in 2017 with the incredible discovery and analysis of the optical counterpart of a gravitational wave event. Further information about this available here. Her science interests are galaxy clusters and gravitational waves for cosmology. While clusters are one of the four traditional cosmological probes, gravitational waves are a promising new potential probe! 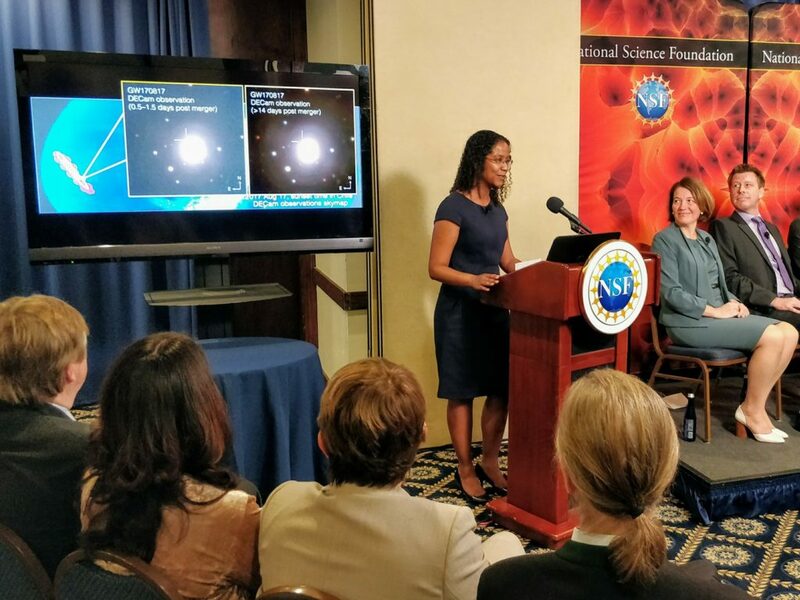 Marcelle is pioneering the DES program to search for the optical counterpart of gravitational wave events from mergers of neutron stars and black holes. These events will be detected by the latest generation of GW detectors, the LIGO and VIRGO detectors, and will show up on DES data as a special type of short-lived point sources, known as “kilonovae”. Detection and study of kilonovae and other types of transient objects is the goal of the Transients and Moving Objects (TMO) Working Group in DES. Marcelle is one of the coordinators of this TMO group. All my talents seem to be related to studying science! As a kid I did try pursuing activities in arts and sports, but it soon became clear that I completely lack talent in those areas. I honestly don’t know what I would do with my life if science could not be a part of it. Find a topic you love, and mentors who propel you forward. Enjoy the journey.